Rapid and erratic movements of Earth’s north magnetic pole have prompted an early update to a model that assists with navigation. The scheduled fix was supposed to happen on January 15, but the U.S. government shutdown has forced an unwelcome delay. The magnetic north pole is shifting at an unprecedented rate. Over the last 30 years, the rate of distance that the magnetic north pole moves per year has sped up, around 15 kilometers (9.3 miles) per year to around 55 kilometers (34 miles) per year, according to Nature. Unlike the static geographic north pole, the north magnetic pole is in constant flux, influenced by the movements of iron-rich fluids deep below the Earth’s crust. Or at least that’s the theory—the whole thing is still somewhat of a scientific mystery. The World Magnetic Model (WMM) provides a five-year forecast of the Earth’s magnetic field, which assists with navigation. But the rapid and irregular movements of the north magnetic pole over the past three years have made the 2015 WMM inaccurate. An unprecedented early update was supposed to happen on January 15, 2019, but that’s been bumped to January 30 owing to the ongoing U.S. government shutdown, reports Nature. The WMM forecasts are produced by the U.S. National Oceanic and Atmospheric Administration (NOAA) and the British Geological Survey (BGS) on behalf of the U.S. National Geospatial-Intelligence Agency and the U.K. Defence Geographic Centre. The WMM describes the primary engine responsible for magnetic pole movement: the Earth’s core. Beginning in late 2014, however, the core geomagnetic field started to shift in a way that hadn’t been predicted, wrote BGS scientist Will Brown at his blog. In addition to this abrupt change, scientists started to observe accelerations of flow in the core in the northern hemisphere. And in 2016, a particularly powerful geomagnetic pulse under South America complicated matters even further, the Nature article explained. By March 2018, the 2015 WMM had become woefully out of date, with the BGS saying it was “no longer meeting its accuracy requirements.” Hence the need to update the map a year earlier than usual. For the fix, scientists will add three years of scientific data to the model, taking the 2016 pulse into account. Obviously, we’re no longer solely dependent on compasses for navigation, so it’s unlikely that ships will run aground or planes will smash into mountains as a result of the government shutdown. But as Brown explains, an inaccurate WMM is not without implications. The WMM is the standard magnetic model used for navigation by organizations such as NATO, the Ministry of Defence, and the U.S. Department of Defense, and also by smartphone operating systems such as Android and iOS. When you open your smartphone’s map app, you may see an arrow pointing which way you’re facing, and there’s something quite clever going on underneath. Your phone contains a magnetometer that is measuring the Earth’s magnetic field. In order to make sense of this information a reference model like the WMM is needed to correct the measurements of magnetic north made by your phone to True North. Indeed, the accuracy of a phone’s compass is only as good as the WMM. For example, let’s say you were on a boat at a distance of 1 mile from the north magnetic pole. The arrow on your phone’s compass will point directly at the magnetic north, but the corresponding map on your phone—because it’s referencing an inaccurate forecast of where the magnetic north should be—will likely give you a false impression of where you are on the planet. And given the degree to which the magnetic north pole is moving each year, the map could be really off. Regardless, it’ll be good to get an accurate WMM in place as soon as possible. 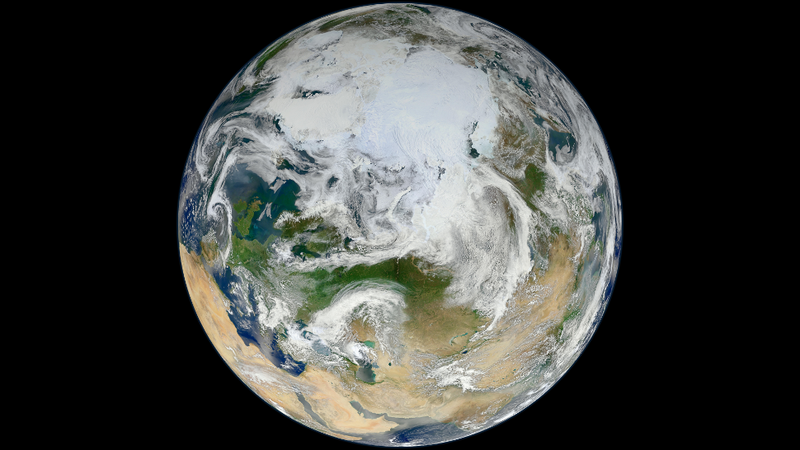 The north magnetic pole shifts around 3 to 5 kilometers (2 to 3 miles) each month in the general direction of Siberia. Ah, nothing like a government shutdown to remind us of the wide net cast by our public institutions.